Do you know people that may benefit from using GQueues? If so, you have a chance to a win a new Chromebook Pixel! Sign in to your GQueues account and click on "Tell your Friends" to email people you know and tell them about GQueues. For each person that logs in you'll get another entry to win the Pixel. The contest ends June 3rd, so start sending your referrals now to maximize your chances. No purchase necessary to enter or win. Read the full contest rules for complete details. The contest is now over. 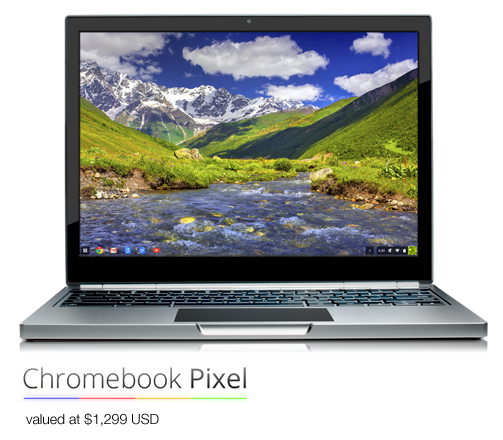 Congratulations to Zane L. of Nebraska who won the Chromebook Pixel! Thanks to everyone who helped spread to word about GQueues.